PHOTO COURTESY: UI HONORS PROGRAM Jeffrey Ding became one of only 32 Rhodes Scholars selected this year from the United States out of a pool of nearly 870 applicants worldwide. He receives a scholarship worth about $50,000 per year for up to three years to attend Oxford University in England. orn in Shanghai and raised in Iowa, Jeffrey Ding sees himself as a natural mediator between the United States and China. As one of only 90 students worldwide named a 2016 Rhodes Scholar, the UI senior recently accepted a prestigious scholarship to attend Oxford University, where he will study ways to improve environmental cooperation between the two countries. "I feel both excited and grateful," says Ding, who plans to earn a master of philosophy in international relations from Oxford in England. "Excited because it's an invaluable opportunity to learn alongside future world leaders. Grateful because it's an opportunity only made possible by a community of support." 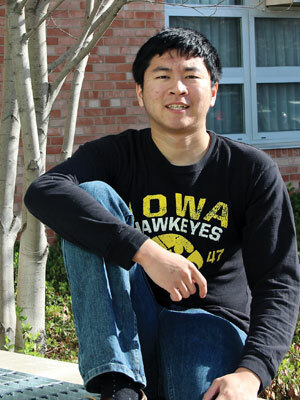 Ding first became interested in global environmental issues as a national debate champion at Iowa City West High School. While researching environmental policies for debate, he sought solutions to curb pollution in the highly influential countries of China and the United States. He found that potential barriers to a healthier environment included the competing economic interests of the nations' fossil fuel companies and protectionist policies that prevent the spread of clean energy technology. Ding says, "One argument I felt especially compelling was that resolving environmental issues like climate change would never be possible without cooperation with China." Ding joins an elite group of 19 UI students since 1905 who have been awarded Rhodes scholarships. He graduates from the university in May with bachelor degrees in economics, political science, and Asian languages and literature, as well as a certificate in international business. While at Iowa, Ding served as student government vice president, participated on the UI debate team, worked on the UI Climate Narrative Project with the Office of Sustainability, took political science classes with former U.S. Ambassador to Eritrea Ron McMullen, 82MA, 85PhD, and accepted internships with the Hong Kong legislative council and the State Department's Bureau of East Asian and Pacific Affairs. Currently, Ding is enrolled at the School of Economics and the School of International Studies at Peking University to immerse himself in the Chinese culture and language. Following grad school, he plans to become a policy or attorney adviser, a think tank fellow, or a Foreign Service Officer. Kelly Thornburg, director of scholar development for the UI honors program, says Ding's world-class academic experience at Iowa has become a point of pride for the university. "The University of Iowa really offers incredible opportunities to undergraduates," she says. "It is so wonderful to have this very prominent example of what our students are able to do as scholars and leaders on our campus."